Now before you conclude that I have lost my marbles, read on. Throughout the world, voter turnout at national elections have been declining, mainly due to apathy of younger voters. This is also true in Aotearoa New Zealand. Our most recent General Elections were held in 2014 and the voter turnout was at an all time low of 77%. Voter turnout for those under 30 years of age was 62%, while 88% of people my age voted. The main reason put forward for poor voter participation by younger people is that they feel that they can make very little difference to the results. While there is some degree of truth in that, especially in electoral systems where “winner takes all” such as with FFP (First Past the Post), the same can’t be said of systems with proportional representation such that used here in Parliamentary elections. If a party gains 5% of the votes, it gets 5% of the seats in the Parliament. in other words, every vote counts. We next go to the polls on Saturday the 23rd of September 2017 to elect our 52nd Parliament. The head of the Electoral Commission (the body that oversees national and local elections in NZ) believes we may see a reversal in the decline in voter participation this year. She gave two reasons: Brexit and Trump. The results of both Brexit and the US presidential elections were due largely to voter apathy. In both cases, younger voters were strongly against the final result, and had younger voters participated in numbers approaching the national average, the results would have been different. It seems that finally there is evidence that NOT taking part in the democratic process can have serious consequences. The good news here is that the younger generations are talking about how and why results such as Brexit and Trump as president could possibly occur. Both results seem contrary to common sense. I do hope that the head of the Electoral Commission is correct and that such discussion will lead to greater voter participation, especially among the young. So thank you Donald, you are the reason the next generation of Kiwis are beginning to take a greater interest in the democratic process. They don’t want to see our leaders behaving as you do. Categories: New Zealand, Politics | Tags: democracy, elections, government, society | Permalink. I make no bones of the fact that I believe Trump represents the worst of American values and “The American Way”. The fact that someone such as he could be freely elected to office at a time when the world requires inclusivism and pluralism, not exclusivism and exceptionalism (and I mean in a humanist and secular sense as well as in a religious sense), makes me wonder whether collectively America has lost its marbles. Do values such as “love and warmth and sympathy” as expressed in my father’s last poem, and so important in my whanau (wider family) count for anything any more? Trump certainly fails on all counts from what I can see. Professor Clements is the Foundation Chair of Peace and Conflict Studies and Director of the New Zealand National Centre for Peace and Conflict Studies (NCPACS) at the University of Otago, Dunedin, New Zealand, and Secretary General of the International Peace Research Association. I believe his post I have linked to below speaks for most Kiwis. Categories: Peace, Politics | Tags: government, ideas, society | Permalink. This post is primarily for Kiwis who haven’t bothered to understand the principles of the Treaty of Waitangi / Te Tiriti o Waitangi. We Pakeha were guilty of ignoring the Treaty for more than a hundred years, and it is only in recent decades that an attempt has been made to redress some of the wrongs committed by the crown over many generations. We still have a long way to go, and it’s often a case of two steps forward and one step back. Too many Pakeha have made no attempt to understand what the treaty means to Māori and to us as a nation, and in essence, want Māori to “integrate” by abandoning all that is sacred and unique about their culture and become “brown Pakeha”. They don’t want Te Reo (the Māori language) taught in schools, nor the preservation of customary rights, and especially not the partial restoration of land and and the payment of compensation for all that was confiscated from Māori after the Land Wars in the latter half of the nineteenth century. 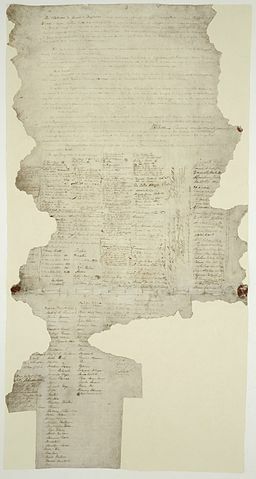 Understanding the spirit of the Treaty of Waitangi is not really too difficult – it consists of three articles. Most of us understand understand Articles I and III, but for many Pakeha and for successive governments we have failed to honour Article II. It’s time this was redressed. The video clip below explains the basic principles of the three articles. Now that wasn’t too difficult was it? Categories: New Zealand, Politics, Treaty of Waitangi | Tags: democracy, government, Māori, NZ | Permalink.